There’s a lot to learn about soybeans! This page contains links to several activities that can be used in the classroom, along with links to other sites with good materials for students, as well as adults. Don’t forget to checkout the links below to discover the history of soybeans and the definition of many food and industrial soy products. Check out our educational video here! Visit our News/Pubs page to view and download our latest educational materials: our GMO brochure, Kentucky Farmers Care, and our newest “Have You Ever Wondered?” brochure, which answers common food questions. The Kentucky Soybean Board has Soybean Science Kits available for YOUR use. Teachers – Incorporate Animal Agriculture into your next lesson! 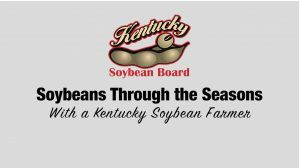 These lessons are made available through a partnership between the Kentucky Soybean Promotion Board, United Soybean Board and Kentucky Farm Bureau.